Have I ever mentioned that my brothers are a little bit silly? Yeah, they used to sing “Chicky-Chicky-Parm, Chicky-Chicky-Parm” whenever my mom would make us Chicken Parmesan. And they always did it with this incredibly catchy but annoying rhythm to it. So now I’m cursed because what I think of every time I have Chicken Parmesan!! Here is an easy and “lighter” (i.e. not fried) version of this dish that you can make in the crock pot. It even came out pretty crispy on the top. Don’t ya just love it when things are easy AND delicious?! NOTE: Chicken can be fresh OR frozen. For frozen (which I used here), simply add an extra hour of cooking time. Apply cooking spray to the inside of your crock pot. Next, set up three shallow bowls. In the first bowl, place the flour and half of the salt and pepper. In the second bowl, place the lightly beaten egg. In the third bowl, place the panko bread crumbs, the parmigiano reggiano, the rest of the salt and pepper, and the Italian seasoning. Take your chicken breasts one at a time, and dip them first in the flour, coating completely. Next coat with the egg mixture. Finally, coat with the panko mixture. Then place the chicken breast in the bottom of your crock pot. Repeat with the other chicken breasts. Pour your marinara sauce around the sides of the chicken breasts. (Around, not on top – this will keep the tops crispy.) 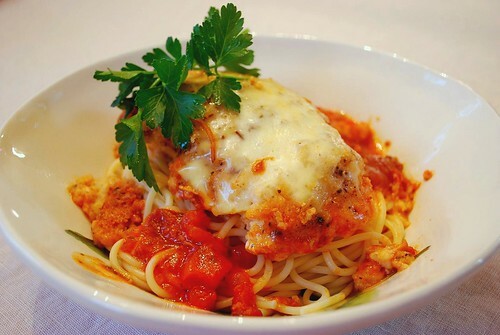 Sprinkle a few more tablespoons of the parmigiano reggiano cheese on top of the breasts. Cover and cook on low for 7-9 hours. 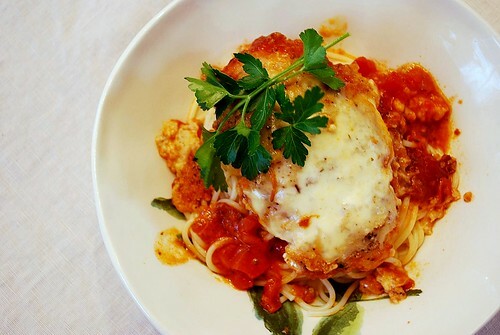 During the last hour of cooking, top the chicken with the shredded mozzarella cheese so that it can melt and get nice and bubbly. Garnish each serving with fresh parsley or basil. 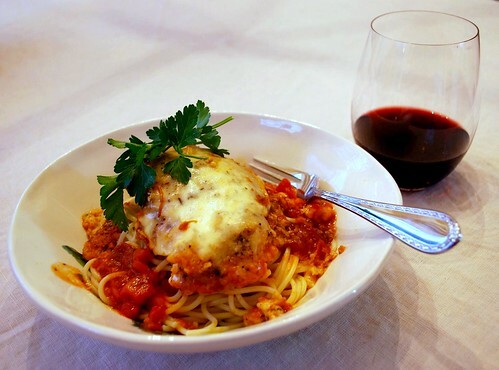 Serve with spaghetti or angel-hair pasta.